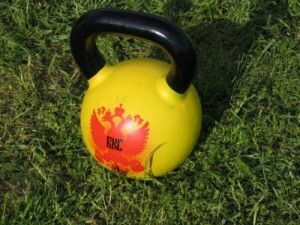 The Girya (Russian: гиря) – as known as Kettlebell – is a traditional Russian training tool. In the old days the bells were used to weigh fodder by peasants and agricultural workers who became stronger. Soon they started to use the kettlebells in pairs, then they replaced the handle with a bar in order to organize competitions. The result was the ancestor of the modern dumbbells. Then the scientific examination of the effects (improved strength, stamina and fitness) of the use of the kettlebells started in Russia, 1913. About a hundred years ago this brilliant tool reached America and the legendary “ The Iron-Master” strongman and circus performer Arthur Saxon made it popular. Generations of russian weightlifters, wrestlers, judo and sambo competitors started use it in their preparation. The system has its own competition as well. The first one was in 1947. Its grandiosity is in its simplicity. It`s a gym in one piece of metal. As anyone who has ever tried it knows, the kettlebell is one of the best tools and methods of improving stamina, fitness and strength. It`s important to understand that the kettlebell itself is just a training tool but there is a modern and scientifically structured system behind it called RKC (Russian Kettlebell Challenge). According to the RKC philosophy the training with the bells helps to achieve: health, excellent physical abilities, good looking body. Today, this order has overturned and the muscular body has become the priority. This is a natural result of kettlebell training but not the primary purpose. While today, there are sizes that range from 8.8 lbs (about 4kgs) to 132 lbs (about 60kgs), the traditional Russian kettlebell is usually one which weighs 1 Pood (roughly 16kg / 35lbs). Unlike traditional dumbbells, the kettlebell”s center of mass is extended beyond the hand, similar to a Clubbell”s. This allows for swing movements not possible with traditional dumbbells. Because more muscle groups are utilized in the swinging and movement of a kettlebell than during the lifting of dumbbells, a kettlebell workout is said to be more effective, and yields better results in less time. Because the center of mass on a kettlebell “swings”, micro-muscles are needed to balance a kettlebell, more so than a dumbbell. The existence of a handle allows for “release moves” which are not available with a dumbbell. Private (1 on 1) or 1 to small group classes are available too. Contact us today!